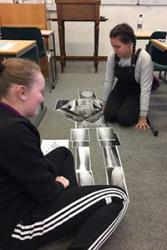 Bryana Donachie and Jessica Hartshorne, both of Rhyl, completing a human skeleton using x- ray images.Young carers from across north Wales were recently invited to Bangor University to sample university life. Twenty-seven young people, aged between 15- 20, enjoyed the first residential taster experience in north Wales which has been specifically designed for them. This was a partnership between Bangor University’s Widening Access Centre, the Carers Trust Wales and Action for Children. The young people were from Ynys Môn & Gwynedd young carers projects, an Action for Children service that supports young carers aged 5 – 18 years. The projects raise awareness, identify and provide direct support to children and young people who look after or help to look after someone in their family who is unwell or has disabilities, including children caring for parents who have mental health or substance misuse problems. “This was an invaluable opportunity for our young carers to consider a path they may have thought was closed for them. There are many young people in north Wales who care for someone at home and they face barriers other young people don’t and can feel higher education opportunities are not possible for them due to their caring responsibilities.